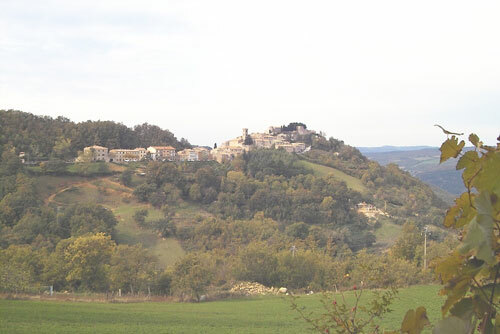 Semproniano stand on top of the hillocks which separate the valleys of the Albegna and Fiora rivers. The centre of Semproniano still maintains its medieval essence, with narrow alleys and stone homes which wind up towards the ruins of the Aldobrandeschi fortress where only the foundations of a powerful tower still remain. The church of Santa Croce (XII century) rises next to the fortress and still holds a wooden crucifix of the XII century. Lower down there is the Pieve with bell tower with two sets of windows with one opening; dedicated to Saint Vincent and Anastasio. Inside, paintings by Vanni. Little distant from Semproniano rises the medieval village of Rocchette di Fazio dominated by the ruins of the Aldobrandeschi fortress: an enchanting place where time seems to have stopped and which has kept its charm, aura of mystery and fantasy intact. This village is full of ancient buildings, some of which like the San Bartolomeo Hospital founded (1330), Palazzo Pretorio and Pieve di Santa Cristina in Romanesque style.